Popularly known as Yogaratna Delampady has succeeded in conducting free yogasana training camps to improve the health of more than Two lakhs (2,00,000) people in and around Mangalore. He has made the people realize the significance of yoga and has taught the people effectively. He can perform more than 120 Asanas and he can explain the benefits of all the Asanas and he follows this style anywhere he goes and performs. His selfless Yogasanas to protect the health of the people, their support and co-operation are the only rewards from them. Modern man is leading a mechanical life in this mechanized world making his body weak and polluting the environment. It has spoiled his health and reduced the power of immunity. But each individual has a special hidden power. This hidden power is brought out in a scientific way through yoga which gives physical and mental peace and contentment. We, Indians have quite ignored this great ancient art and science westerners have realized the significance of this ancient science and have happily adopted it. Yogaratna Sri Gopalakrishna Delampady of Mangalore is one of the very few Kannadigas who is trying to preserve and develop this ancient art. 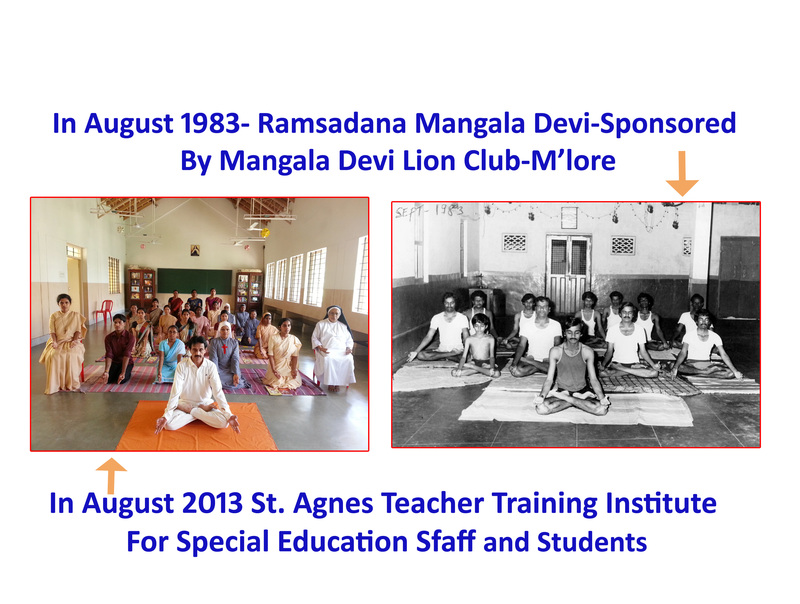 He has been conducting free experimental yoga classes since twenty five years. Sri Delampady was born on 14.03.1958 as the fourth son of Patel Krishnayya Katooraya and Smt Parijata at Delampady of Kasaragod district. He received his primary education at Delampady and Sullia and collegiate education at St. Aloysius College, Mangalore. He has been working as a senior health inspector in Mangalore corporation office. Sri Gopalakrishan Delampady learnt ‘Yoga’ by Sri Puttappa Joshi of Sullia and Sri Guru Chidananda of Vittal. He was also guided by Sri Raghavendra Swamy Malladihalli. Sri Delampady teaches Yogasanas which improve one’s health by removing diseases of the body through Yogasanas. Explaining the significance of each Asana according to the situation in his style. Because of this, the practitioners can pick Yogasanas which suit them and practice them during their free time to protect health. Normally people hesitate to practice Yogasanas due to lethargy or due to lack of time. In Sri Delampady’s classes importance is given to Yogasans, simple Pranayama and meditation based on necessity and time available. The significance of Yogasanas can be appreciated only when one realizes its uses. Although Yogs is an ancient art, recently people are attracted towards Yogasanas after understanding the significance of Yogasanas to maintain their health. If one learns Asanas is a continuous systematic way with interest, then only he can fetch its reward. It is not easy to teach Yogasanas to others understanding their necessities. Learning an asana involves different poses of the body, control of breath, position of the sight etc. In yoga camps Kriyas, Bandhas, Mudras, Pranayama and Dhyana are taught effectively. He made his debut as a yoga teacher in 1977 and started free yoga camps in 1983. He has held more than 750 yoga camps in the Schools, Colleges, Hostels, Lions Club, Rotary Club, Friends Club, Sri Raghavendra Mutt, Arya Samaj, Sri Narayana Guru Mandir, N.I.T.K. Suratkal, Havyaka Sabha Mangalore, M.C.F. Colony, Kudremukh Colony, Viveka Jagrata Balaga, Sandesh art School, Corporation office, Eshwariya Vidyalaya of Mangalore and in different places of Kasaragod. He has trained more than 50,000 people and a number of well known employed people have undergone training under him who are grateful to him for guiding them to protect their health through Yogasanas. His admirable quality is that he explains the preparation, the pose of asana, physical and mental benefits of the asana to the young and the old in such a way that it fills new vigour and inspiration in anyone. Even lethargic people also get new inspiration by his effective explanation. He is a humble, ever smiling friend of all. His eldest son Dr.Kishan Delampady is a yoga practitioner finished his M.D. and his younger son Kiran Delampady has secured first place in yoga competitions at District level continuously eight times. He also won the coveted champion of champions’ title and secured first place in the state and national level Yogasana competitions.Kiran Delampady has completed Engineering graduation & presently working in Vedantha Company. In the International level Himalaya yoga Olympiad conducted at Bangalore in 2003 students under his guidance won more than eleven prizes. Sri Yogaratna Gopalakrishna Delampady was selected as the team Manager of Men’s team in the national level yoga competition held in 2004. He has served as a referee in state level and international level yoga competitions. He has written a handbook called ‘Yogasana to protect health’ a hand book which yogasana for which disease’, ‘Yogasana for women, Yogasana Margadarshi’ a calendar entitled ‘Yogasana for health’, ‘Mudras for Health’ and has written articles on Yogasana in deities, weeklies monthly magazines. The Sanskrita Sangha of St. Aloysius College conferred the title ‘Yogaratna’ in the year 1999. Sri Pejavar Vishweshwara Teertha Sri Padangalavar, Sri Veerendra Heggade, Dharmadhikari of Dharmasthala, Sri Laxmi Narayan Asranna of Kateel, Jr. Chambers of Mangalore. Sri Raghaveshwar Bharati Swamy of Ramachandrapur Mutt, have honoured, felicitated and blessed Sri Gopalakrishna Delampady. The local T.V. channel has telecasted his interview and presentations. Sri Gurudevanand Swamiji of Odiyoor has honoured and blessed him in 2005. besides spoorthi youth club of Delampady and Mangalore. Jr. Chambers have honoured him giving the title ‘Outstanding young person on 8.4.2000. Rotary club of Mangalore has conferred ‘Udyoga Shreshta Prashasthi’ on him on 26.10.2006. In the yoga programme held at Bangalore in the memory of Dr. Rajkumar on 24.9.2006. Sri Delampady was conferred the title ‘Yogacharya’. Encouragement is necessary: It is a duty of all of us to encourage Sri Delampady who has been spreading the knowledge of Yogasanas selflessly. If there is proper support Sri Delampady will certainly popularize ‘Yoga’ throughout the country and even in the foreign countries.